Are you planning a long motorcycle trip with your buddies in the upcoming vacations? Or do you plan to visit your romantic partner who is out of the city, on your motorbike? 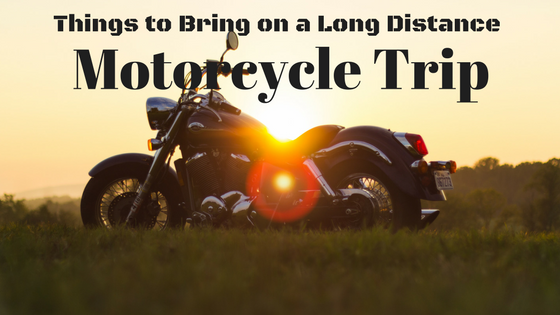 Then you must be reading this article very thoroughly because we will be telling you some of the essential items you should carry while making a long distance motorcycle trip. On a long distance journey, you never know when there is going to be an issue with your bike, and whether you can find a mechanic easily. In this case, you need to have a complete tool kit with you which should have patches, plugs, insertion tools, glue, pressure wheel, hole cleaner, a knife for plug trimming and other things. A chain wax, spare keys, and extra oils might also be the components you should consider. It might appear to be an outdated suggestion, but keeping a printed version of the map is always advised. Google MAPS can always help, but in case you end up in an area where there is no service, or your phone runs out of charging, a printed map will help you from losing the track. Try going for a map that has been specially designed for motorcyclists. They also include some stop shops for bikers on the way. Within your helmet, you must integrate a Bluetooth headset. This is the easiest way to talk to someone while riding or turning on vocal navigation on your smartphone. This kind of headset also helps you during a short break, when you have to refuel your fuel tanks, just want to eat or have some photos while answering your phone calls at the same time. Yes, this is a very important item especially if the trip is really long. You might have an urge to go when there is no proper restroom available, hence you should always have toiletry kit, which should have a toilet roll, hand sanitizer, bug repellent, washcloth, deodorant, toothbrushes, toothpaste etc. this kit may also include some regular medicines, such as painkillers, anti-allergy, anti-inflammatory and others. You might be having a wallet full of credit and debit cards, but many roadside stop shops do not accept them. This is why you must have sufficient amount of extra cash with you at all times. This should be sufficient enough for you to make a safe return to your home, in case something happens to your bike. Other necessary items for a longer bike ride include a battery pack, headlamps, extra pair of gloves, ear plugs, proper clothing, caps, jackets, lock security system, roadside cleaners, pack able rain gears, an extra pair of sunglasses, a diary with important phone numbers and your blood group mentioned, etc. With all your supplies ready, you are now ready for a long distance motorbike ride. Remember that speed might thrill, but safety should be your first concern. Have a memorable adventure.